The Lexus GS (Japanese: レクサス・GS, Rekusasu GS) is an executive car sold by Lexus, the premium division of Toyota. The same car launched in 1991 as the Toyota Aristo in Japan, but the Lexus-badged model did not appear until 1993. Now in its fourth generation, the GS sold under the Aristo name in Japan only until the release of the third generation model in 2005. Designed as a performance sedan competing in the mid-luxury class, the GS slots between the compact executive IS and large/flagship LS, and shares its chassis with one of Toyota's longest-running platforms: the S-series which has been used under multiple generations of the Toyota Crown premium sedans. The fourth-generation Lexus GS premiered in August 2011 at the Pebble Beach Concours d'Elegance, where models introduced included the V6-powered GS 350, hybrid GS 450h, and performance-tuned F Sport variants. A lower-displacement V6 model, the GS 250, premiered at the Auto Guangzhou Exhibition in November 2011, targeted at Asian and European markets. In some markets such as North America, the GS shares the mid-size sedan category in the Lexus lineup with the front-wheel drive ES. Italdesign Giugiaro began the first design drawings of the GS 300 in 1988. The design firm aimed to produce a deluxe saloon which did without the numerous exterior features and detailing found on existing Japanese premium sedans, in favor of a more simplified, European-style appearance. The vehicle's exterior styling blended elements of the then-current Lexus LS flagship and SC performance coupe in a rounded, aerodynamic wedge-like shape which featured a high rear decklid and longer and wider proportions than rival vehicles. The exterior produced a drag coefficient of Cd=0.31. The offered color schemes included single-tone bumper and body finishes, along with dual-tone schemes. Similarities with an Italdesign concept car which debuted in 1990, the Jaguar Kensington, led some observers to suggest that the GS 300 was derived from its design, but the firm has stated that the GS 300 was developed earlier. Equipped with an independent, double-wishbone suspension setup at both front and rear ends, Italdesign's saloon design first appeared in Toyota Aristo form in Japan in October 1991. Built at Toyota's Tahara assembly plant in Japan, production of the Aristo involved more automation than previous vehicles built at the Tahara factory; robots performed 4,200 welds on each body, while only eight spot welds were performed by hand. Toyota of Japan offered two straight-six engine options for the Japanese market Aristo—the 3.0Q and 3.0V. The 3.0Q (JZS147) featured the 2JZ-GE engine which produced 169 kW (227 hp), while the Aristo 3.0V (JZS147) was equipped with a 24-valve twin-turbo 2JZ-GTE engine which produced 205 kW (275 hp). The Aristo was exclusive to the Toyota Vista Store as the top level luxury sedan at Vista dealerships, positioned above the Toyota Cresta and Chaser. In 1992, a third model, the V8-powered 4.0Zi-Four (UZS143), joined the Aristo lineup. This model came with standard all-wheel drive and a 186 kW (249 hp) 1UZ-FE engine. Production of the export Lexus GS 300 (JZS147) began on 22 February 1993. For Lexus, The GS was placed above the front-wheel drive ES luxury sedan with its superior drivetrain setup, power and available amenities. Lexus only offered the GS with the 3.0-liter 2JZ-GE straight-six, producing 169 kW (227 hp) and 285 N⋅m (210 lb⋅ft) of torque. 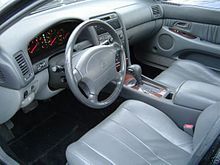 For the interior, the GS 300 featured walnut wood trim on the center console, leather seating, an automatic tilt-and-telescoping steering wheel, and the option of a Nakamichi premium stereo system. Driver and front passenger airbags were standard. A moonroof, remote 12-CD auto changer, and traction control (TRAC – left hand drive vehicles only) were options. The GS was intended to take the price position of the original LS 400 flagship, which had moved upmarket since its 1989 launch. By the time of the GS 300's debut, the US$35,000 initial base price of the LS in the United States had climbed to US$47,000, while the GS 300 at debut carried base price of US$38,000. However, sales of the GS 300 were modest, with 1993 seeing the greatest sales at 19,164 sold that year. Sales dropped in later years as the Japanese yen rose in value against the dollar and made the vehicle more expensive than its rivals. Additionally, more powerful V8 sport sedans provided strong competition. By 1997, the price of the GS 300 had risen to US$46,000. Production of the first generation GS sedan ended in July 1997. In 1993, after sales commenced for the first generation S140 series, development began on the successor under the internally known codenamed JZS160. The design process began under chief engineer Yasushi Nakagawa in May 1994 and by November 1995 after 18 months of design work, the final production design by Akihiro Nagaya was approved by the executive board. In January 1997, Lexus debuted the "High Performance Sedan" (HPS) concept at the Detroit Auto Show, previewing the design direction for the redesigned GS. In August 1997, the second generation Toyota Aristo was launched in Japan, codenamed JZS160 (S300 version) for models with 2JZ-GE engines and JZS161 (V300 version) for those with 2JZ-GTE twin-turbocharged engines, remaining exclusive to the former Vista network that was renamed Toyota Netz Store Japanese dealerships. VVT-i was now standard, resulting in an increase of torque. The twin-turbocharged version was available with electronic four-wheel steering, VSC electronic stability control and an automatic transmission with a manual sequential mode. The second generation sedans used a new front-engine, rear-wheel drive midsize platform, also featured in the Japanese-market Toyota Crown. The new model's styling was produced in-house, and featured quadruple headlights in a fashion similar to the Lexus SC coupe. It had a drag coefficient of Cd=0.30. Inside, electroluminescent Optitron gauges were offered for the first time, along with an upgraded stereo system. For export markets, the second generation GS began production in the JZS161 body style on 4 August 1997 and was officially launched in late 1997. Lexus offered the GS 300 once again and featured a slightly revised version of the previous generation's 3.0-liter straight-six now producing 168 kW (225 hp) and 305 N⋅m (225 lb⋅ft) of torque. Answering customer requests for more power, the American market GS 400 (UZS160) was equipped with the 4.0-liter 1UZ-FE V8 that produced 224 kW (300 hp) and 420 N⋅m (310 ft⋅lb) of torque. Both models featured a five-speed automatic transmission with the GS 400 receiving steering wheel shift buttons. As with the S140 series, no turbocharged variants were offered outside Japan. The 0–60 mph (0–97 km/h) time of the GS 400 prompted Lexus to claim that the GS was the world's fastest production sedan at its introduction in 1997. The 1998 BMW M5 sedan would list 0–60 mph (0–97 km/h) times of between 4.8 and 5.2 seconds. Lexus promoted the arrival of the second generation GS sedan with the tagline, "Something Wicked Comes This Way." Compared to its predecessor, the second generation GS sedan was a much bigger success, with sales reaching 30,622 vehicles in its first year, increasing in the second, and stabilizing at 28,079 vehicles by 2000. Lexus would keep the second generation vehicle in its lineup for eight years, a longer duration than the prior generation. The U.S. base price for the GS 300 and GS 430 averaged approximately US$38,000 and US$47,000 respectively. The GS was Motor Trend's Import Car of the Year for 1998. It also made Car and Driver magazine's Ten Best list for 1998 through 2000. In IIHS frontal crash testing the 1999 and newer GS was given a "Good" overall score. In 2000, a facelift (designed in mid-1999) was introduced for the 2001 model year, which was the only year with any major changes in the second generation GS. New clear tail lights with turn signal indicators were added to the trunk area, as well as a slightly revised grille and very subtly tinted headlights on the front end. Xenon high-intensity discharge headlights were now standard on the V8 and optional on the straight-six. Inside, more wood trim was added, and steering wheel shift buttons were now also featured on the GS 300. The V8 engine also received a 0.3-liter increase in displacement and the model was renamed GS 430 (UZS161). Peak power was unchanged, but torque increased to 441 N⋅m (325 lb⋅ft). The GS 430 took 5.7 seconds to do 0–60 mph (0–97 km/h). For the 2001 model year, Lexus also added a limited production GS 300 "SportDesign" edition for North America, featuring the sport suspension from the GS 430, wider tires, and polished alloy wheels. The SportDesign interior added perforated leather upholstery along with brushed aluminum and dark stained walnut trim. For the third quarter of 2001, production of the GS 300 SportDesign was limited to a run of 3,300 units (vs. 25,000 annual GS sales annually). Production of the limited model occurred through 2004. In 1999, development commenced on a successor to the JZS160 under chief engineer, Shigetoshi Miyoshi. Styling for both the exterior and interior was done under lead designer Yasuhide Hosoda between 2000 and 2002, during which L-finesse came to fruition in 2001. By 2002, a design was finalized, to be introduced the following year. In October 2003, Lexus debuted the LF-S (Lexus Future Sedan), a concept car which previewed the design of the upcoming GS. The design patent was filed by Toyota on 22 December 2003 in domestic Japanese patent offices, preceding an imminent public unveiling. The third generation GS first appeared as a pre-production vehicle at the 2004 North American International Auto Show on 5 January, with the production version shown at the same show in 2005. Production of the third generation began on 24 January 2005, without release of an equivalent Toyota Aristo, as Toyota had introduced the Lexus channel to Japan and sought to align all world markets using Lexus as their luxury brand worldwide. The third generation GS was the introductory Lexus model for the marque's new L-finesse design philosophy, indicating the future direction of the Lexus lineup; it featured a fastback profile, retained quad headlights, LED tailamps, and one-piece bumpers. This generation GS had a drag coefficient of Cd=0.27, and used a newly designed midsize platform later shared with the second generation IS. In September 2005, the GS 350 (GRS191) and GS 430 (UZS190) went on sale in Japan; the GS 350 using a 3.5-liter 2GR-FSE engine with D4-S direct injection, while the GS 430 used the same 4.3-liter 3UZ-FE V8 engine used in the previous model. 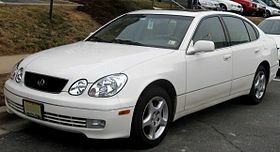 Sales in the US began in March 2006, with the initial lineup including the GS 300 (GRS190), featuring a ULEV certified 3.0-liter 3GR-FSE V6 engine, and the GS 430 featuring the 4.3-liter V8. All GS models at launch featured a new six-speed automatic sequential shift gearbox. An all-wheel drive system was made available in the GS 300. Unveiled at the 2005 New York International Auto Show, the hybrid GS 450h (GWS191) joined the GS line in 2006 for the 2007 model year. GS Hybrid production started in February 2006. It was the first mass-production rear-wheel drive luxury hybrid car, featuring the naturally aspirated 3.5-liter 2GR-FSE V6 engine mated to an electric motor and a continuously variable transmission (CVT). This powertrain made use of the Lexus Hybrid Drive system of integrating electric and gasoline engine motors, giving the GS 450h a Super Ultra Low Emissions Vehicle (SULEV) emissions rating, and total output of 253 kW (339 hp), allowing the GS to accelerate 0–60 mph (0–97 km/h) in 5.2 seconds, according to manufacturer data. New to the GS line was an electric power steering (EPS) system, and both the V8 and hybrid models featured a variable gear ratio steering (VGRS) system and Electronically Controlled Brake (ECB) a type of brake-by-wire system. V8 and hybrid models also featured an adaptive suspension system that individually altered suspension damper firmness. Vehicle Dynamics Integrated Management (VDIM) was standard on the GS 430, 460, and 450h models and coupled to VGRS, with which it could alter steering gear ratios. Third generation GS interior (GWS191), with hybrid kilowatt meter instead of tachometer and G-Book navigation. Standard safety features on the GS ranged from multiple airbags, including knee airbags and front row side torso airbags, to adaptive headlights, anti-lock braking, electronic brakeforce distribution, brake assist and electronic stability control. The radar-based pre-collision system with an autonomous cruise control system was optional. The GS 450h was among the first vehicles to receive the infrared Driver Monitoring System for driver attentiveness. For the 2007 model year, the GS 350 replaced the GS 300 in the US and several other export markets. The GS interior was available with leather bird's-eye maple or walnut trim. Major standard features ranged from a 10-way driver and front passenger power and heated seats with three-position Lexus Memory System, SmartAccess keyless system with push-button start, a driver-side hidden drop-down panel for infrequently used controls, standard 7 in (180 mm) touchscreen display, and LED lighting in the cabin. Unique to the Lexus GS series was a three-pod instrument cluster with machined aluminum facings and an electrochromic feature. Optional features ranged from a power moonroof to a discrete 5.1 surround sound 14-speaker 330-watt Mark Levinson premium sound system, XM-satellite radio and DVD-based navigation with backup camera and Bluetooth technology. Competitors to the Lexus GS included the BMW 5 Series, Mercedes-Benz E-Class, Volvo S80, Audi A6, Jaguar XF, Infiniti M, and Acura RL. The GS 460 (URS191) replaced the GS 430 in 2007 for the 2008 model year, featuring a new 4.6-liter 1UR-FSE V8 engine with eight-speed automatic transmission generating 255 kW (342 hp) and 460 N⋅m (339 ft⋅lb) of torque. Lexus reported a 0–60 mph (0–97 km/h) time of 5.4 seconds. Along with the hybrid GS 450h and previous GS 430 models, the V8-powered GS 460 offered the Active Stabilizer Suspension System for improved handling. The GS 450h retains its position as the most expensive in the GS lineup, and has faster acceleration than the GS 460, though the GS 460 is lighter and has a higher top speed. In 2010, the GS was outsold nearly two to one by the flagship LS. Along with the introduction of the GS 460, the GS lineup received a mid-cycle styling refresh, including a revised front bumper, headlights and grille, turn signals added to the side mirrors, and new wheel options and exterior colors. The interior received a redesigned steering wheel, revised instrument cluster gauges, and different trim pieces. In the third quarter of 2007, development began on the L10 series GS under Yoshihiko Kanamori, with the design process finalizing under new president and CEO Akio Toyoda's direction in 2009. Design patents were filed in Japan on 6 October 2010 for the production model and a conceptual variant on 29 March 2011. In April 2011, Lexus showed the LF-Gh concept (Lexus Future Grand-Touring Hybrid) at that year's New York International Auto Show, previewing the stylistic direction of future Lexus models. The LF-Gh featured a large, spindle-shaped front grille, and press information further indicated that it had a new interior design which included an analog clock. The LF-Gh concept vehicle was taken by automotive journalists as an indication of what the fourth generation Lexus GS would look like. The fourth generation GS had its world premiere at the Pebble Beach Concours d'Elegance in California in August 2011. The vehicle was shown to have a more subtle version of the LF-Gh's spindle grille, while overall exterior dimensions are almost identical to the previous generation. L-shaped LED front daytime running lamps and rear LED tube lamps are a new design feature. The new GS was the centerpiece of Toyota chairman Akio Toyoda's initiative to restore passion to the Lexus brand and better compete with German luxury automakers that had been gaining market share in the United States. It was reported that Toyoda initially opposed the styling choices made for the new model, but since thanked the design team that persuaded him to greenlight the project. At its debut, the fourth generation model was shown in rear-wheel drive GS 350 (GRL10) form, powered by a V6 engine linked with a six-speed automatic transmission. Three driving modes are featured, ranging from fuel-conserving Eco to Sport S and Sport S+ which facilitate more sporty transmission shifting and engine throttle settings, as well as suspension damper and steering adjustments. The chassis has been redesigned, and overall curb weight is reduced. To reduce unsprung mass the new GS utilizes aluminum for all its suspension components. The GS 350 F Sport adds a rear-wheel steering system for improved handling on rear wheel drive models. New larger 14-inch brakes come standard as well as 19-inch F Sport wheels, a new front bumper, rear spoiler, F Sport steering wheel, F Sport seats and a new suspension system with AVS adjustable dampers. The redesigned interior gains the Lexus Remote Touch mouse controller system in place of the previous touchscreen, linked to a split-view 12.3 in (310 mm) widescreen dashboard display. Other interior features include Mark Levinson surround sound system. Front 18-way power seats are available; 10-way power seats are equipped standard. Optional features further include a pre-collision system, Heads-Up Display, blind spot monitor, lane keep assist, and Driver Monitoring System. 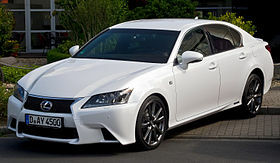 Variants such as the GS 350 and GS 250, as well as their F Sport variants, began sales in Japan in 26 January 2012, followed by the GS 450h and the GS 450h F Sport on 19 March 2012. Sales for the fourth generation in the US began in February 2012 for models including the GS 350 and GS 350 F Sport, with the hybrid version following several months after. A smaller-displacement model, the GS 250 (GRL11), was shown at the 2011 Auto Guangzhou, targeted for sales in China, Japan, Australia and the UK, but not the US. The GS 450h (GWL10), rated at 252 kW (338 hp) and now using an Atkinson cycle design, has a 35 percent improvement in fuel economy over the previous generation GS 450h, and has a higher combined EPA fuel efficiency rating (31 mpg) than the 306 horsepower GS 350 (23 mpg). Trunk space is improved both for the hybrid and standard models. The GS 450h features standard full LED headlamps and a bamboo trimmed interior. The vehicle was unveiled in 2011 Frankfurt Motor Show. For the 2014 model year, changes to GS 350 includes eight-speed automatic transmission with steering for rear-wheel drive (RWD) model, introduction of F SPORT package (optional Lexus Dynamic Handling system with dynamic rear steering (DRS), electric power steering, variable gear ratio steering (VGRS)), integrated Siri Eyes Free mode from Apple (compatible with iPhone 4S and newer), flush mounted sensors for available intuitive park assist, full color display added to the optional head-up display, available blind spot monitor adds rear cross traffic alert and power-folding mirrors, Luxury Package changes (LED foglamps, Superchrome finish for 18-inch wheels, and the rear armrest control panel display adds display option to view radio station and song title information), optional power trunk opener, Lexus Night View system discontinued. The GS 300h hybrid model includes a 2.5-liter Atkinson cycle inline-four engine with a D-4S direct injection technology, derived from the third-generation Lexus IS. The vehicle was unveiled in 2013 Shanghai Motor Show. The vehicle went on sale in China, Europe, Asia, Australia, and New Zealand, but not in the US. It is a version of Lexus GS 300h for European market, with 2.5-liter Atkinson cycle four-cylinder engine (181PS), two electric motors, a hard-drive navigation system with a 12.3-inch Monitor and Lexus Connected Services, a premium audio system, DVD player and rear-view camera with a monitor, among other features. The vehicle went on sale in 2014-01-11. The revised GS debuted at Monterey Car Week in August 2015. Changes include a GS 200t variant equipped with the 2.0-liter 8AR-FTS turbocharged engine to replace the GS 250, and an update to the 3.5-liter V6, now upgraded to 2GR-FKS specification. that uses the Atkinson cycle and features founded on the previous 2GR-FSE motor. Additional changes include revised exterior elements (including front and rear trim, exterior lighting, wheels, and rocker panels), new active safety features, and a revised infotainment system. The Lexus GS was used in Motorola Cup North American Street Stock Championship touring car series competition in 1998, beginning with two GS 400 race vehicles driven by Team Lexus in its inaugural season. For 1999, Team Lexus achieved its first victory with the GS 400 in its sixth race at Road Atlanta. The GS 400 was raced until 2001, when Team Lexus switched to the IS 300. In the mid-2000s, the GS 400 was entered in the V8Star Series touring car racing season, with Ronny Melkus competing in the V8 GS in 2003. In 2006, Sigma Advanced Racing Development and Lexus entered a GS 450h performance hybrid sedan in the 24 Hours of Tokachi race in Hokkaido, Japan, the first time that a hybrid vehicle was introduced. In 2007, Lexus Canada also entered the GS 450h in the Targa Newfoundland event. In 2009, the GS 450h was used as a safety car at the Muscle Car Masters event held at Eastern Creek Raceway, Eastern Creek, New South Wales, Australia. In 2008, Manabu "Max" Orido used a second generation JZS161 Aristo in Formula D competition. Orido has several second generation models with different equipment used for drifting events, some with prototype suspension, and fitted with parts from the export Lexus GS 300. Sales data for Lexus GS generations are as follows. Sourced from manufacturer yearly data. J.D. Power and Associates named the GS series the best midsize luxury car in initial quality for 2002, 2003, 2004, and 2005. AAA named the third generation GS 300 the best car in its class for 2005. Consumer Reports awarded the Lexus GS as the highest ranked vehicle in predicted reliability in the luxury car class in 2005. The GS 450h's Lexus Hybrid Drive system was the recipient of the annual Paul Pietsch Prize for Advanced Technology in 2007, awarded by technical editors of Auto Motor Und Sport publications. The Lexus GS 450h was named the winner of the 2007 IF product design award from the International Forum Design group in Hannover, Germany. German automotive magazine Auto Bild selected the GS 450h for its "Auto 1" award for best sedan in 2007. Smart Money magazine named the Lexus GS the best luxury sedan for the 2003–2004 model year. In 2005, the magazine named the GS its Best New Car Value. The GS series was named most appealing midsize luxury car by J.D. Power and Associates in 2001. The first generation GS series was named to the Top Ten in Initial Quality list by J.D. Power and Associates in 1994. Kelley Blue Book gave the GS series its Best to Hold Value Award in 1998, 1999, 2000, and 2001. The second generation GS was named Import Car of the Year by Motor Trend in 1998. Car and Driver named the second generation GS to its Ten Best list in 1998, 1999, and 2000. ^ Toyota Motor Corporation. "Lexus GS (GS430/GS350)". Retrieved 30 December 2012. ^ "Site Map". Australia: Lexus. Archived from the original on 11 April 2014. ^ a b Lienert, Paul (23 November 2011). "Lexus GS 250 Unveiled: 2011 Guangzhou Auto Show". Insideline.com. Retrieved 8 April 2012. ^ Jackson, Jim (18 December 2011). "Lexus marks midsize luxury". Northwest Indiana Times. Retrieved 8 April 2012. ^ a b c d "Tahara Plant". Toyota Motor Corporation. 2012. Retrieved 18 July 2014. ^ a b c d "GS 300 (Aristo): Italdesign Giugiaro". italdesign.it. 2012. Archived from the original on 8 July 2011. Retrieved 24 May 2012. ^ a b c d e f Schuon, Michael (8 August 1993). "Lexus Weighs in With a 'Grand' Sedan". The New York Times. Retrieved 9 January 2009. ^ a b c d e f g h i j k Dawson, Chester. Lexus: The Relentless Pursuit, pp. 146–47, 164–65. 2004: Jon Wiley & Sons, NJ. ^ "A Look Back: The 1997 Detroit auto show". AutoWeek. Retrieved 19 January 2012. ^ "Aristo history トヨタ アリスト 中古車総合情報". Goo-net.com. Retrieved 28 October 2011. ^ "PH Heroes BMW E39 M5". Pistonheads.com. 26 December 2007. Retrieved 8 April 2012. ^ "IIHS-HLDI: Lexus Gs". IIHS. 10 April 2006. Retrieved 21 May 2009. ^ a b c Jordan, Michael (2001). "2001–2005 Lexus GS300 SportDesign". Automobile Magazine. Retrieved 9 January 2009. ^ "Detroit Auto Show 2004 Highlights". cardesignnews.com. Archived from the original on 29 February 2012. ^ "New York 11' Preview: Lexus Releases Teasers of the LF-Gh Hybrid Concept". thetorquereport.com. ^ "2003 Lexus LF-S Concept". Automobile.com. Retrieved 22 September 2009. ^ Automotive Engineering International, Volume 113, pp. 1, 28; New platform for Lexus GS, IS. ^ "Officially Official: 2008 Lexus GS 460 and 450h". Auto Blog. ^ a b Reed, Philip. "Full Test: 2007 Lexus GS 450h". Edmunds. Retrieved 31 March 2009. ^ "Lexus Introduces Next Generation Vehicle Stability Control System in New 2006 GS 430". Worldcarfans. 3 February 2005. Retrieved 21 May 2009. ^ "Lexus GS – Features & Pricing – Safety & Security". USA: Lexus. Archived from the original on 27 September 2011. Retrieved 28 October 2011. ^ "2006 Lexus GS Sedan Debuts Mark Levinson Surround Sound System". Worldcarfans. 3 February 2005. Retrieved 21 May 2009. ^ "Toyota USA Newsroom" (PDF). toyota.com. Archived from the original (PDF) on 17 May 2011. ^ a b "2010 Lexus GS 450h Reviews, Expert Car Reviews on AOL Autos". AOL. Retrieved 28 October 2011. ^ "History of the Lexus GS". UK: Lexus. 30 September 2013. Retrieved 29 September 2018. ^ "Japanese Production Sites". Japan: Toyota. 6 March 2015. Archived from the original on 18 March 2015. ^ Hans Greimel. "For Lexus, high-profile nose job brings new attitude". Automotive News. ^ Oldham, Scott (22 July 2011). "2013 Lexus GS 350 First Drive". Edmunds.com. Archived from the original on 23 July 2011. ^ Jeremy Korzeniewski RSS feed. "Lexus LF-Gh Concept unveiled ahead of New York debut". Auto Blog. Retrieved 8 April 2012. ^ Reid, Rory (April 2011). "Lexus LF-Gh is a mean, green hybrid machine". Cnet UK. Retrieved 13 April 2011. ^ a b c d e f g h i Damon Lavrinc RSS feed. "2013 Lexus GS 350 fully revealed at Pebble Beach". Auto Blog. Retrieved 8 April 2012. ^ Ulrich, Lawrence (11 May 2012). "Action-Oriented Sedan With a Predatory Spirit". The New York Times. Retrieved 21 May 2012. ^ Kim Reynolds (25 January 2012). "2013 Lexus GS 350 F Sport First Test". Motor Trend. Retrieved 18 March 2012. ^ a b "2013 Lexus Launch – GS 350, GS-F Sport and GS 450h Previews". The Auto Channel. Retrieved 8 April 2012. ^ "TOYOTA MOTOR CORPORATION GLOBAL WEBSITE – 75 Years of TOYOTA – Technical Development – Body". toyota-global.com. ^ "Lexus Marks New Stage with Japan Rollout of New GS Lineup". Retrieved 27 January 2012. ^ a b "Big Lexus GS hybrid sedan gets a 35% fuel-economy boost". USA Today. 29 November 2011. Retrieved 8 April 2012. ^ "2013 Lexus GS 450h Rated at 34 MPG Highway, GS 350 at 28 MPG – KickingTires". cars.com. 28 November 2011. Retrieved 8 April 2012. 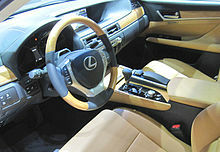 ^ "Details on the Lexus GS 450h Bamboo Steering Wheel". Lexus Enthusiast. 9 February 2012. Retrieved 8 April 2012. ^ Jonathon Ramsey. "2013 Lexus GS 450h does the electric slide". Autoblog. ^ "2014 Lexus GS gets eight-speed auto, other enhancements". ^ "Lexus GS 300h Debuts at 2013 Shanghai Motor Show". ^ "LEXUS INTRODUCES GS 300h AT SHANGHAI MOTOR SHOW". Archived from the original on 22 August 2014. ^ "Lexus GS 300 Business Edition for Europe". Autospress. ^ Carscoop Carscoop. "Lexus Targets Business Customers with New Edition of GS 300h in Europe". Carscoops. ^ "Mingling with the Classics: Lexus Introduces 2016 GS During Pebble Beach Concours Celebrations". Toyota Motor Sales. United States. 13 August 2015. Retrieved 22 August 2015. ^ Ruhi, Joaquín (31 August 2015). "From FSE to FKS: the evolution of Toyota's 2GR 3.5-liter V6". Kaizen Factor. Retrieved 24 July 2016. ^ "Team Lexus Stats". Team Lexus. 2006. Archived from the original on 21 August 2007. Retrieved 6 May 2007. ^ "Speedsport Magazine 2003 german V8 Star". Speedsport-magazine. Retrieved 28 October 2011. ^ "Lexus GS 450h in 24 Hours of Tokachi". Response.jp (in Japanese). 18 July 2006. Retrieved 20 May 2009. ^ Bowman, Zach. "Autoblog – GS 450h safety car". Auto Blog. Archived from the original on 10 September 2009. Retrieved 28 October 2011. ^ "10 Reasons to Check Out Formula D Las Vegas". Urban Racer. Archived from the original on 29 September 2011. Retrieved 28 October 2011. ^ a b "1999 Lexus Aristo – HKS Turbo – Import Tuner Magazine". Importtuner.com. 26 February 2007. Retrieved 28 October 2011. ^ a b c d e f g h i j k l m n "Lexus Knowledge Center – GS Model Specifications". USA: Lexus. Archived from the original on 19 April 2010. Retrieved 18 May 2010. ^ "US top 24 luxury automobile and light truck model types by sales in units for 1996." Automotive News. Market Data Book Supplement (1997). ^ "Lexus sales figures 2000–2001". Autochannel. 3 January 2002. Retrieved 28 January 2009. ^ a b "Lexus sales figures 2001–2002". Autochannel. 3 January 2003. Retrieved 26 January 2009. ^ "Lexus sales figures 2002–2003". Autochannel. 5 January 2004. Retrieved 26 January 2009. ^ "Lexus production figures 2003–2004". Autochannel. 4 January 2005. Retrieved 26 January 2009. ^ a b "Lexus sales figures 2005–2006". Autochannel. Retrieved 28 October 2011. ^ a b c "Number of Vehicles Produced in Japan by Model" (PDF). Japan: Toyota. 2007. Archived from the original (PDF) on 29 December 2009. ^ a b "Lexus sales figures 2007–2008". Autochannel. Retrieved 28 October 2011. ^ "Number of Vehicles Registered in Japan" (PDF). Archived from the original (PDF) on 6 March 2012. Retrieved 28 October 2011. ^ "Number of Vehicles Produced in Japan by Model" (PDF). Japan: Toyota. 2008. Archived from the original (PDF) on 30 December 2011. ^ "Number of Vehicles Produced in Japan by Model" (PDF). Japan: Toyota. 2009. Archived from the original (PDF) on 12 June 2009. ^ "Number of Vehicles Produced in Japan by Model" (PDF). Japan: Toyota. 2009. Archived from the original (PDF) on 12 July 2010. ^ "Lexus sales figures 2009". Autochannel. Retrieved 28 October 2011. ^ "Number of Vehicles Produced in Japan by Model" (PDF). Japan: Toyota. 2010. Archived from the original (PDF) on 9 July 2010. ^ "Lexus sales figures 2010". Autochannel. Retrieved 24 January 2015. ^ "Lexus sales figures 2011". Lexusenthusiast.com. Retrieved 24 January 2015. ^ "Lexus sales figures 2012". Lexusenthusiast.com. Retrieved 24 January 2015. ^ "Lexus sales figures 2013". Lexusenthusiast.com. Archived from the original on 25 January 2015. Retrieved 24 January 2015. ^ a b Cain, Timothy. "Lexus GS Sales Figures". GoodCarBadCar. Retrieved 16 March 2016. ^ "December 2016 and Year-End Sales Chart" (Press release). USA: Toyota. 5 January 2017. Retrieved 5 January 2017. ^ a b Lexus Australia GS line Archived 17 December 2009 at the Wayback Machine Lexus.com.au. Retrieved 2010-05-18. ^ a b c Lexus China CS line Archived 2009-09-19 at the Wayback Machine Lexus.com.cn. Retrieved 2010-05-18. ^ a b c d Lexus Europe ES range Archived 2010-06-16 at the Wayback Machine Lexus.eu. Retrieved 2010-05-18. ^ a b Lexus Saudi GS line Archived 17 December 2009 at the Wayback Machine Lexus.com.sa. Retrieved 2010-05-18. ^ a b c Lexus Canada GS series Archived 9 February 2010 at the Wayback Machine Lexus.ca. Retrieved 2010-05-18. ^ a b c Lexus Japan GS line Archived 2010-02-08 at the Wayback Machine Lexus.jp. Retrieved 2010-05-18. ^ a b c Lexus GS detailed specifications Lexus.com. Retrieved 2010-05-18. ^ "J.D. Power and Associates 2003 Initial Quality Study". J.D. Power. 13 January 2011. Archived from the original on 13 July 2011. Retrieved 28 October 2011. ^ "Toyota, GM Garner Most Awards in 2005 Initial Quality Study". J.D. Power. 13 January 2011. Archived from the original on 29 May 2007. Retrieved 28 October 2011. ^ "AAA Picks 13 Top Cars for 2005". American Automobile Association. Archived from the original on 29 September 2011. Retrieved 28 October 2011. ^ "Consumer Reports: Most reliable cars '06". CNN. 27 October 2005. Retrieved 28 October 2011. ^ "Continued global awards success for Lexus". Lexus Europe. 2007. Archived from the original on 4 May 2007. ^ ""Auto 1" Awards, Auto Bild Group". PR Newswire. 7 March 2007. Retrieved 8 April 2012. ^ Breckenridge, Sarah (7 October 2003). "2003–2004 Car Buyers Guide: Best Cars for Your Buck". Archived from the original on 25 November 2006. ^ "J.D. Power and Associates Reports: New and Redesigned SUVs Have Strong Appeal Among New-Vehicle Buyers". J.D. Power and Associates. 1 October 2001. Archived from the original on 30 June 2006. ^ "Kelley Blue Book (KBB) Best Resale Value Award Winners". Carfax. Archived from the original on 25 November 2003. 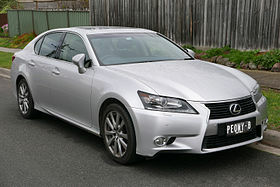 Wikimedia Commons has media related to Lexus GS. This page was last edited on 21 March 2019, at 07:30 (UTC).